Pete Seeger, the legendary folk singer and activist who led the revival of American Folk music in the mid-twentieth century, died on Monday, January 27, 2014, in his home in Beacon, New York at the age of 94. 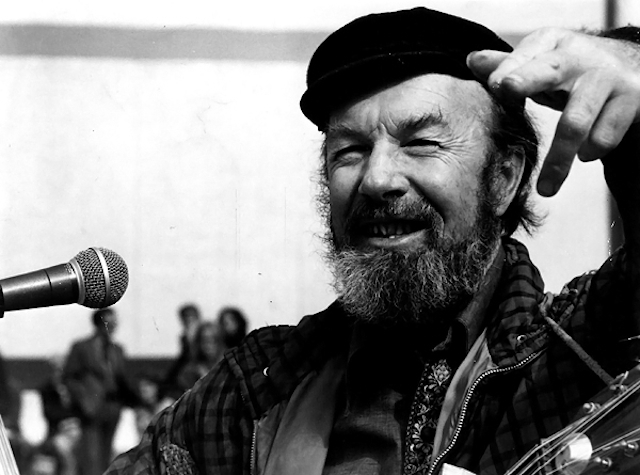 Pete Seeger was an extremely talented musician who tried to create awareness through music. During World War II, Pete Seeger was a member of the very political The Almanac Singers founded by Millard Lampell, with Lee Hays and Woody Guthrie. The group disbanded due to government intervention over the band’s politics. In 1950, Pete joined the The Weavers, a folk quartet comprised of former bandmate Lee Hays, Ronnie Gilbert and Fred Hellerman. The group focused primarily on American folk songs, labor songs, international songs, blues, gospel and ballads. They also disbanded due to the government pressures of McCarthyism as they were blacklisted by the House Committee of Un-American Activities. Pete went on as a solo artist after the disbanding of The Weavers, tackling such issues as war, global disarmament, unions, civil rights and the environment through his songs and activism. His gentle manner, good humor and velvet voice made Pete Seeger a mentor to artists such as Bruce Springsteen, Bob Dylan and Neil Young and an inspiration to many, many more. Thank you Mr. Seeger for giving us hope. The world will miss you.